Tempest is the women’s specific fit version of Osprey's iconic Talon series. When it comes to high-energy pursuits, the Tempest 16 won’t disappoint. 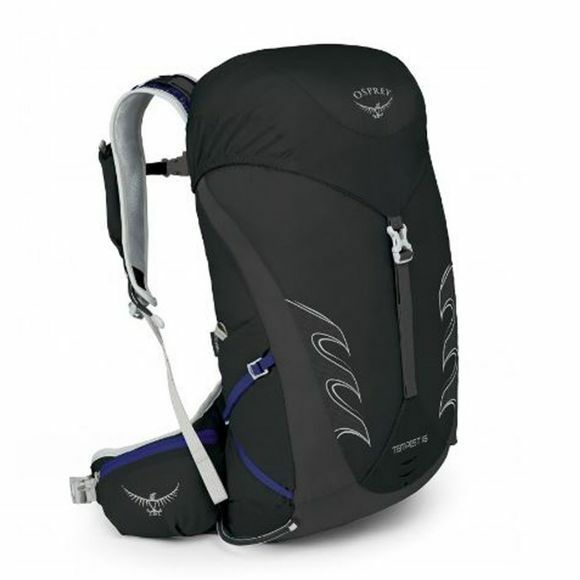 The AirScape wings that wrap around the pack to compress your load tightly, great for when walk becomes run. The back panel and die-cut foam hipbelt and harness keeps your load under close control but allows ventilation where you need it. The zipped pockets on each side of the hipbelt allow for quick and easy access to smaller items like your phone, powerbar, GPS etc. while the single buckle lid closure means rapid access and great load compression from the top. On top of the lid you will find another conveniently placed pocket, ideal for gloves, hat, maps etc. The side compressors can run either under or over the stretch powermesh side pockets.